ALASKA banked on a strong finish as it added to the misery of Star with an 85-69 decision in the PBA Governors’ Cup at the Panabo City Multipurpose Tourism, Cultural, and Sports Center in Davao del Norte on Saturday night. The Aces saw the Hotshots make a comeback from a 20-point deficit, but countered with their own salvo to win a game of runs and roll to the victory that snapped a three-game skid. Import LaDontae Henton fired a team-high 27 points, including three on a three-pointer off a Calvin Abueva feed that sparked the Aces’ 10-1 run to finish the Petron Saturday Special game. The Aces thus avoided their longest losing streak in seven conferences under coach Alex Compton as they improved to a 2-3 win-loss record, while the Hotshots absorbed a third straight loss to join Blackwater at the bottom at 1-5. “The biggest thing we talked about was having a defensive mindset and getting back to defending,” said Aces coach Alex Compton, whose team held the Hotshtos to just seven points in the second quarter. Hotshots import Joel Wright put up a monster game of 30 points and 22 boards, numbers that were still not enough to produce a win in his second game since replacing former Best Import Marqus Blakely. The Hotshots, who trailed, 45-25, earlier in the third period, came to within seven points, 75-68, after a Marc Pingris basket, with a little over three minutes left, before the Aces scored all but one of the game’s last 11 points. 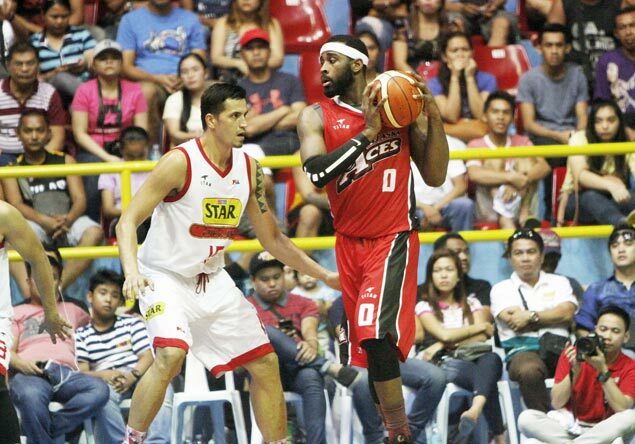 The Aces asserted their mastery of the Hotshots, whom they've beaten for the seventh successive time.